Our first dive was at low tide and we knew that meant a wicked current. The ocean didn't disappoint us. At about 15 feet we saw Cladophora in the water column. A few more kicks seaward and it was clear we had plenty of it growing about--what we have now come to call "The Ropey Kind". Working our way to the Turtle House took more time and more air than we'd like to admit. 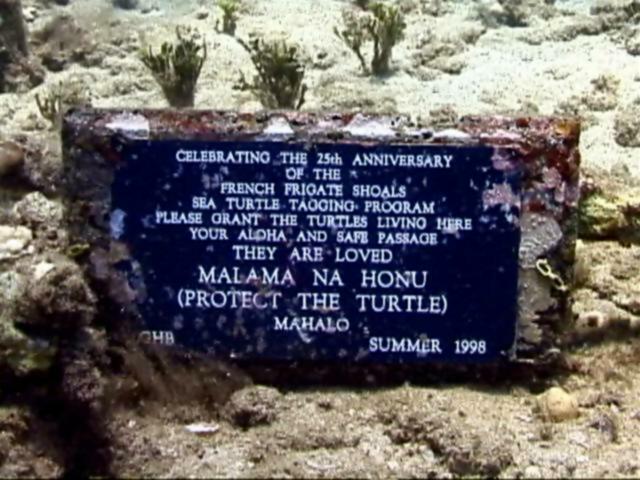 We stopped at The Gateway to check out the Plaque we'd laid down to celebrate the 25th Anniversary of the French Frigate Shoals sea turtle tagging programme. The plaque had shifted so it pointed straight down. When we righted it, scale had grown across much of the writing. We carefully scraped this material off, admired our plaque and then kicked further seaward. We admired our plaque and then kicked further seaward. At the Turtle House we saw four turtles, and only one showed a total lack of concern (or interest) in our approach. We recognized him immediately as Fred, a young turtle we've known since 1992. We only stayed at the Turtle House for five minutes before heading to Reef 2. The strong current did most of the work for us--but we had to be careful to kick towards shallow water because the ocean was tugging seaward in addition to south. At Reef 2 we saw a half dozen turtles. It's clear they'd decided to stay home and hang around their turtle tramples instead of visiting the Turtle House. We resighted Zeus (known since 1992) but our biggest surprise was seeing Zaphod (known since 1993). We'd never seen Zaphod at Reef 2 before--her preference being a ledge at the Turtle House, where she had spent many summers with her head tucked in a hole. Zaphod allowed us to approach as closely as we wanted. Her tumors have continued to shrink, while her keg-sized girth has girthed some more. It was good to see Zaphod again. Dive 2 was very interesting. We'd decided to see if we could document early morning foraging behavour. We entered the water at 6:15 AM and proceeded to where we saw turtles feeding the previous morning. We saw heads poke up, so we moved in that direction. 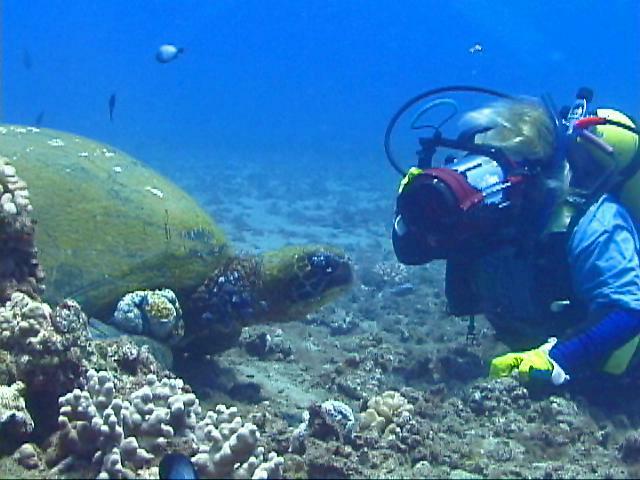 We didn't see a single honu feeding. Uncanny. They must have sensed we were there and avoided us completely. In deeper water we saw our friend Polzbarney. He's in worse shape than last year. We don't expect to see him next summer. All tumors have gotten worse and he's even grown some new ones. We kicked out to Reef 2, but few turtles were there. They were likely still feeding. Later on, however, they began showing up, but by then our air was low and we headed back to shore. We stopped on the way to collect several bags of Cladophora and noticed the stuff looked sickly--won't be surprised if in a day or two, there won't be a trace of the stuff. We stopped on the way to collect several bags of Cladophora. Odd, very odd. On our third dive, we visited the Turtle House and only one turtle was there. As was the case the previous day, there wasn't a single turtle at the Rock and Restsite. Have they abandoned this area in favour of Reef 2, or somewhere else? 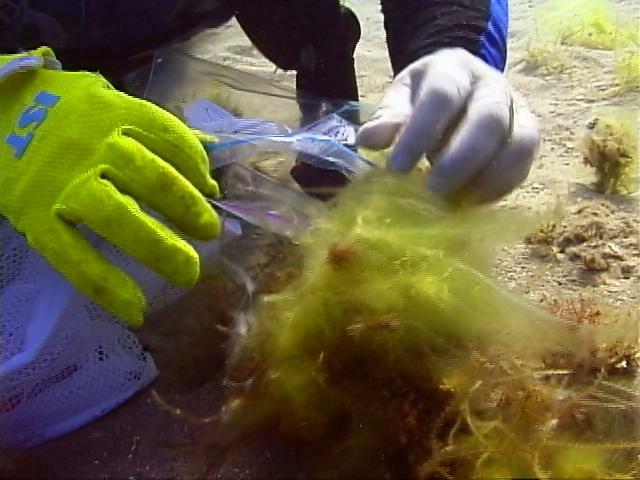 We swam seaward to determine whether there was Cladophora growing in the Outback Halimeda. There wasn't. We did, however, see a badly tumored turtle. We did, however, see a badly tumored turtle. Our old friend Kaula (known since 1989) developed a small tumor in his left eye last summer. We feared for him. We resighted him resting in his trample and there is no evidence of that eye tumor. Of course we still need to do a thorough full body video record on him, but we're optmistic that we will be able to add Kaula to our growing list of regression cases before the end of the summer. Finally, there's Zeus. He developed eye tumors in 1997 after living at Honokowai since 1992. Last summer we detected some tumor shrinkage--but not enough for us to confidently declare him a regression case. We saw the Big Guy yesterday and his eyes look just fine. What this means is in just three dives we have three new regression cases--all males. One of these, Hoa, matured into a male this past year. Yes, we still have some sad FP cases, but to see so many honu doing well--prospering, maturing--is cause for celebration. We hope this "pattern" holds for the rest of the summer. 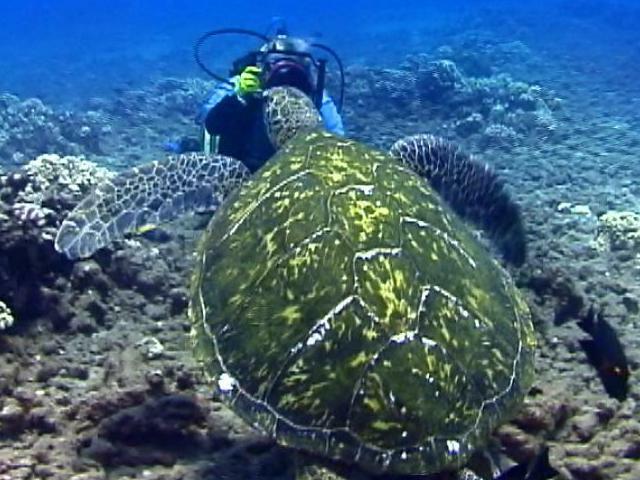 Yes, the honu look good!